Señor & Señora Melendez have two businesses in Nogales, Sonora, Mexico. For one, they sell fresh and artificial flower arrangements. The other is professional photography for weddings, quinceañeras, and special events. 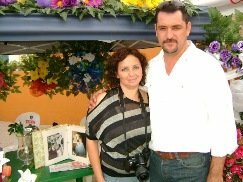 They borrowed 10,000 pesos (about US$833), from a charitable micro-lending organization supported by ProMex Group, five months ago to start the flower arrangement business. This gives them more stability with the two businesses. Their family of seven lives on the proceeds from these two businesses. If you support creating economic opportunities along the Mexican border (in Mexico), consider supporting ProMex Group (charitable microfinance for the Mexican border). You can Donate, Lend, Donate items (especially computers), allow us to Speak and Visit the project. Please contact us for more information.